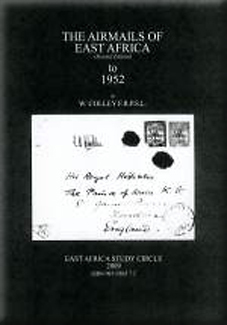 By the time this review appears in print every collector of East African airmail material will doubtless have acquired this comprehensive and splendidly illustrated work. So it is for consideration what attraction it holds for a wider readership. Its early pages have much to say to those with an interest in the story of colonial East Africa. Later the appeal is to philatelists concerned with the posts of the region or with airmails generally. The adventurousness of the early flights is shown by the hazards in the air or on land or on water facing aviators, initially official pathfinders seeking a route to South Africa. Then there were the daring individuals, notably Sir Alan Cobham, the Swiss Walter Mittelholzer, Lord John Carberry, Lt Col Kitson, Beryl Markham and, especially, Tony Gladstone who was commissioned by three governments of the region. They sometimes carried passengers, rarely mailbags but usually souvenir cards and envelopes, fine examples of which in the author’s collection are illustrated. The route usually taken was along the Nile valley, using aircraft equipped to come down on water. The problems of finding places to come down and refuel and of communications are topics of which the author’s career enabled him to grasp thoroughly. As the 1920s came to an end plans were made for a regular service from Britain by Imperial Airways. By the Spring of 1931 this had reached Uganda via Egypt and Sudan. The following year it was extended to South Africa. The Imperial Airways’ route crossed the western side of East Africa. But an East African company formed by the formidable Mrs Wilson was being developed and this took on the mail to Nairobi, Mombasa, Dar es Salaam and Zanzibar by air. Italy’s entrance into World War II brought great changes to East African air services. The Mediterranean route was closed and the Abyssinian campaign had to be supported. Wilson Airways closed down and its aircraft passed to the RAF. Mail from Britain went by sea to Durban whence BOAC flying boats on ‘the horseshoe route’ carried it to Dar es Salaam and Mombasa. As the war ended BOAC used York aircraft now routed through Nairobi. The East African Airways Corporation was set up in 1945 by the East African governments to provide links between all four territories. By 1952 no less than 11 other airlines were serving Nairobi. The second half of this work shows what air travel was possible, containing as it does timetables including those of the wide-ranging Wilson Airways from its hub in Nairobi, including a ‘goldfields service’ to Geita and a link with the Northern Rhodesian copperbelt. Finally are shown the markings to be found on airmail covers and the gazette notices that set out the tariffs for air mails.